It's easy for those of us who oppose the Government's immoral slaughtering of Iraqis to blame George W. Bush & Co. But perhaps this war is not as 'cut and dried' as we might want it to be. Each of us has to ask himself if he doesn't bear some responsibility, no matter how indirect, for these deaths. The war is for oil. And certainly those at the top stand to profit a great deal in acquiring access to the rich Iraqi oil fields, just as they stand to profit from the pipelines through Afghanistan that will bring to tankers in the Persian Gulf oil from the former Soviet republics to its north. But that brings up the question of why they will profit from this, and the obvious answer is that they will profit because you and I want that oil. We need it. Our American way of life depends upon it. We take so much of our lives for granted. We turn a knob on our walls and expect our basement furnaces to turn on and warm up our homes every morning. We have wires stuck in our walls that power our refrigerators, our computers, our air conditioners, our dishwashers, our televisions . . . . We have automobiles that take us to work, to the movies, and to the supermarket where we have access to an incredible amount of food. That this is little short of a miracle rarely occurs to us. We barely realize that a hundred years ago, someone needed to keep a wood or coal fire burning and that someone had to physically feed and stoke that fire every morning, not simply turn a knob, slide a lever, or push a button. We barely realize that a hundred years ago we depended primarily on horses or ' gasp! ' walking to get places, that many of us lived and worked on farms, and that if we lived in town, chances are we lived rather close to where we worked and where we bought our food and other goods. We barely realize that a hundred years ago few of us ever ventured more than ten miles from where we were born. While this way of life seems just normal to us, it's actually a freak occurrence in human history. Even today, relatively little of the world's population has such a lifestyle, a lifestyle almost totally removed from real work, real suffering: real blood, toil, tears, and sweat. We've removed ourselves from all through the application of energy. And we think we'll live like that forever. But we won't. We can't. We cannot sustain this kind of lifestyle much longer simply because the world is running out of oil. And the end of oil doesn't just mean the end of heating oil and gasoline. It doesn't just mean the end of petroleum-based fertilizers with which we can grow an immense amount of food on relatively little land. The end of oil means the end of electricity. And the end of electricity necessarily means the end of modern civilization. Richard Duncan PhD, of the Institute on Energy and Man, has postulated what he calls the 'Olduvai Theory' after Olduvai Gorge, where the remains of the first humans were found. To summarize his theory very briefly, Olduvai is not only where we began, it's also where we'll end up. He writes that "In 1989, I concluded that the life-expectancy of Industrial Civilization is horridly short. This hypothesis was defined in terms of a measurable index, world energy-use per person, and named the 'transient-pulse theory of Industrial Civilization.' I sketched its maximum point at 1990, followed by a persistent decline . . . . By 1996, however, I had successfully tested the Olduvai theory against numerous sets of data. The following facts emerge. 'The broad sweep of human history can be divided into three phases. 'The first, or pre-industrial phase was a very long period of equilibrium when simple tools and weak machines limited economic growth. 'The second, or industrial phase was a very short period of non-equilibrium that ignited with explosive force when powerful new machines temporarily lifted all limits to growth. 'The third, or de-industrial phase lies immediately ahead during which time the industrial economies will decline toward a new period of equilibrium, limited by the exhaustion of nonrenewable resources and continuing deterioration of the natural environment. "The life-expectancy of Industrial Civilization is less than one-hundred (100) years. Industrial Civilization doesn't evolve. Rather, it rapidly consumes 'the necessary physical prerequisites' for its own existence. It's short-term, unsustainable. This is a one shot affair . . . there will be one chance, and one chance only." "The Olduvai theory states that the life-expectancy of Industrial Civilization, defined in terms of world energy use per capita (e), is less than or equal to 100 years. "HISTORY: We know that the peak of (e) occurred in 1979 and that (e) declined from 1979 to 1999 (the 'slope'). He concludes that 'The Olduvai 'slide' from 2001 to 2011 may resemble the 'Great Depression' of 1929 to 1939: unemployment, breadlines, and homelessness. As for the Olduvai 'cliff' from 2012 to 2030 ' I know of no precedent in human history. 'Governments have lost respect. World organizations are ineffective. Neo-tribalism is rampant. The population is over six billion and counting. Global warming and emerging viruses are headlines. The reliability of electric power networks is falling. And the instant the power goes out, you are back in the Dark Age. I do not know if this theory is true. But it certainly has the ring of truth to it. It is thinkable. We all know down deep that our aberrant way of life is not sustainable. 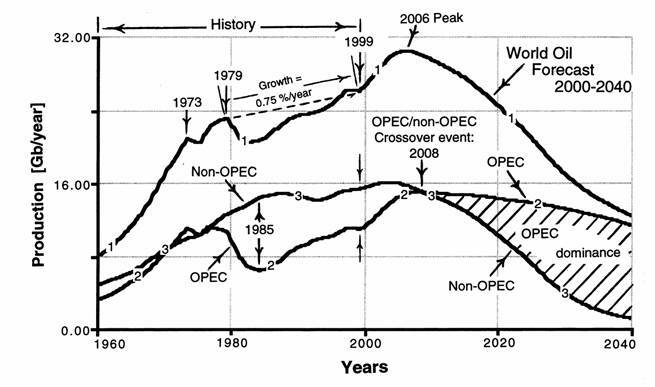 My question, then, is this: what if the world has even less oil than predicted in these charts? What if, in the minds of G. W. Bush & Co., conquering and occupying Afghanistan and Iraq are necessary, an emergency measure to keep the power on in the United States? Let's be as blunt as possible: What if this war is not metaphorically but literally a battle for 'our way of life'? What if that way of life depends on killing those people and taking that oil, and taking it now? What if not killing them and not taking it means an end to our ease and our comforts? Are we willing to kill others to sustain our lifestyle? If we knew killing X number of people out of sight on the other side of the world would guarantee our way of life for the rest of our lives, would we go along? Conversely, would we be willing to give up this way of life so that these others might live? These are difficult, horrible, terrifying questions that I think each of us has to ask himself. Please don't misunderstand me. I don't mean to morally justify in any way what the American government is doing in the Middle East. But if we're to end this war, and if we're to prevent wars like this from happening again, we have to understand it. It's much too easy to simply blame others. We have to ask ourselves honestly and bravely why it's occurring. We have to ask ourselves hard, hard questions. I'm not so sure, though, that any of us, you or me, will like the answers or their implications.